You are grant ready, you received a Federal Grant. The Grant Award Notification (GAN) under Administrative Information says "Regulations 2 CFR as applicable, CFR Part 74, 75, 77, 79, 82, 85, 86, 97, 98 and 99". Do you know what this means??? What is 2 CFR 200? Let's go through some questions why this uniform guidance was needed anyway?? Q1. Why was this uniform guidance necessary? Ans: Office of Management & Budget (OMB) wanted to streamline the Federal government's guidance on Administrative Requirements, Cost Principles, and Audit Requirements for Federal Awards. This was needed to more effectively focus Federal resources on improving performance and outcomes while ensuring the financial integrity of taxpayer dollars in partnership with non-Federal stakeholders. Q2. What is the goal of this guidance? Q3: What will this guidance improve? Ans: It will improve the integrity of the financial management and operation of Federal programs and strengthen accountability for Federal dollars by improving policies that protect against waste, fraud, and abuse. It will increase the impact and accessibility of programs by minimizing time spent complying with unnecessarily burdensome administrative requirements so recipients can achieve program objectives. Q4: What was eliminated with this new guidance? Ans: Previous regulations A-102 & A-89, A-87, A-133 & A-50, A-110, A-21, & A-122 were all eliminated. Q5: What is 2 CFR 200 and where do you find it? 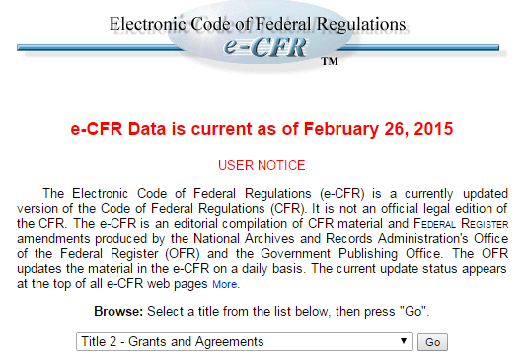 Ans: CFR is known as Code of Federal Regulations. You can find it on www.ecfr.gov/ where e means electronic Code of Federal Regulations. This will apply to all the Federal grants that your organization receives along with any other regulation the funding agency will apply. For example: Department of Education (DOE) will apply 2 CFR plus Education Department General Administrative Regulations (EDGAR. I hope you find this blog post helpful as you manage grants. In the following weeks, we will go through all the parts of 2 CFR. Stay tuned as we break down what uniform guidance really means to your organization and how it applies to your grants. Question: Please share how your knowledge on uniform guidance was approved after this post? Older PostAre you Grant Ready? ?